(PNS) As Hurricane Florence bears down on the eastern coast of the United States, Presbyterian Disaster Assistance (PDA) and Presbyterian Women (PW) are sending out the reminder that September is recognized as National Preparedness Month (NPM). Since 2014, through the Presbyterian Women Disaster Preparedness program, PDA and PW have collaborated to assist congregations and presbyteries to create disaster preparedness plans. 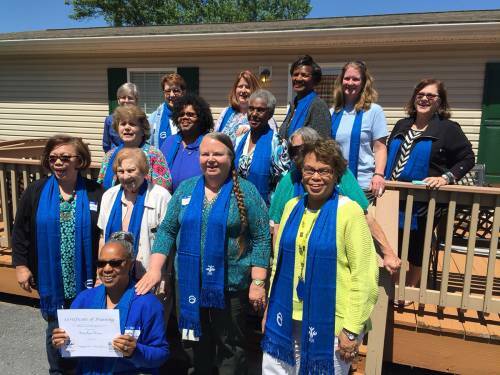 Today, there are more than 150 women from 68 presbyteries across the country, including 43 new trainers at the Churchwide Gathering of Presbyterian Women last month in Louisville, Kentucky. Carolyn Thalman, a member of First Presbyterian Church in Winchester, Virginia and a PDA National Response Team (NRT) member, was part of the group that wrote the first training curriculum for Presbyterian Women. She’s currently the team lead for the PW disaster preparedness program. “We’ve seen firsthand how presbyteries and congregations with disaster preparedness training have benefitted from disaster plans. We encourage all families, congregations and mid-councils to create or review their disaster plans now,” said Beth Snyder, PDA associate for Program Administration and Presbyterian Woman. As an NRT member, Thalman and her husband – also an NRT member – are on stand-by waiting to be deployed pending the landfall of Hurricane Florence and an invitation from an affected presbytery. Highlighted by the Federal Emergency Management Agency (FEMA), the 2018 NPM’s mission is “Disasters Happen. Prepare Now. Learn How.” Several disaster-related resources are available at www.ready.gov, including knowing which types of disasters could affect the area you live in and making a plan in case your family is not together when a disaster strikes. FEMA also emphasizes practicing your plan, assembling an emergency kit with water and non-perishable items for family and pets, and making sure your contact list is up-to-date for people that you need to reach during a disaster.